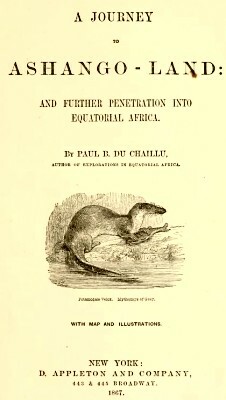 paul du chaillu : canoe surfing, africa, 1863. Translated from rthe French by Richard Owen. D. Appleton and Co., New York,1867. The next subject to be considered was how we were to get ashore. of the Fernand Yaz had changed much for the worse since I had left, and that it would be less dangerous to run a canoe through the surf to the beach than to attempt an entry into the mouth of the river. It was now the beginning of the rainy season, when the winds are less rough than in the dry season, but the surf, under the influence of the steady south-west winds, was still frightful. However, the first landing, in Adjouatonga's boat, which was much steadier than the rest, was made with safety. The frail canoe was skilfully directed towards a promising roller at the right moment, and we were carried on its back with lightening speed to the beach, where we were snatched up by the natives assembled to meet us. After this hazardous landing, I was hurried along amidst a crowd of several hundred savages, all dancing and shouting with frantic joy, across the sandy tongue of land to the banks of the Fernand Yaz, where canoes were ready to take us up the river to the village of Ranpano. It was now necessary to return on board the schooner, and arrange the mode of disembarkation of my extensive outfit and stock of goods. mouth of the river had become so unsafe, from the breaking up of the sandy spit, and as no one knew the direction of the deep channels - for the whole breadth of the mouth of the river was one uninterrupted line of breakers - we resolved to land everything on the beach through the surf. But on some days the breakers were so bad, continuing all day long without a single lull, that it was impossible to do anything. On the 15th of October we made a commencement. Three native canoes were brought alongside, and I began by loading them with my most valuable articles. In one of them I placed all my scientific instruments, sextants, chronometers, prismatic compasses, barometers, &c., besides five large Geneva musical boxes (intended as presents to the native chiefs), and five barrels of salt meat, a case containing 1,500 rifle bullets, a box of medicines, and many other things. Captain Yardon and myself embarked in this boat on account of the value of its cargo, and away we went amidst the cheers of the dusky paddlers. Tlie two other canoes took the surf first. The rollers were terrific, and the boats seemed buried in the seething spray without a chance of coming out of it safely, but they reached the shore without upsetting. The captain himself had misgivings as to the result of our venture. I advised him to put on his life-belt, but in the excitement of the moment he neglected the precaution. which from time to time swelled up and arched gently over, but with headlong speed, towards the shore. We had not, however, the good fortune to be borne by it in safety ; our boatmen, in their great anxiety to avoid a mishap, were not venturesome enough, they waited a few moments too long. Instead of carrying us onward, the huge wave broke over our canoe, upsetting it and hurling us to a distance away from it. Heavy, short breakers now succeeded each other with awful rapidity ; the sea all around became one mass of foaming billows ; and in a few moments we were almost exhausted with the buffetings we received. The negroes who had formed the crew of the canoe, most of whom were my own "boys," companions of my former expedition, swam towards me, and with great exertions kept me from sinking. They assisted me to divest myself of my shoes and my coat, the pockets of which were filled with small weighty articles, and as I became weaker, through the effects of drinking so much salt water, they swam under me and buoyed me up with their own bodies. I caught a glimpse of poor Captain Yardon at a distance from me, struggling with the waves ; the men had devoted all their attentions to me, so I shouted to some of them to go and help him. Meantime, several unsuccessful attempts were made by the negroes ashore to launch canoes to the rescue, but they were all swamped one after the other. their duration, that the only chances occur of reaching this difficult shore. When the sea is rough, in the height of the dry season, these lulls do not occur for days together. A favourable moment at length arrived ; a canoe reached us, and we were delivered from our perilous situation. This was the fifth time during my experience of this coast that I had been upset in the breakers, and saved by the exertions of these faithful negroes. Geoff Cater (2013) : Paul Du Chaillui : Surf Canoeing, Africa, 1863.